What better gift for a new baby? The creator of I Kissed the Baby! celebrates animal moms and babies in an irresistible novelty book.A giraffe kiss is very tall — just turn the page and see! Elephant kisses are long, of course, while tiny mice and bubbly fish have kisses all their own. 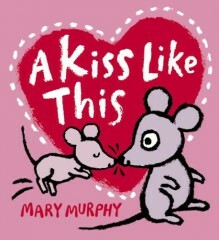 Using a clever split-page format that makes for charming surprises, author-illustrator Mary Murphy shares a series of animal kisses that are sure to have babies and toddlers gurgling, giggling, smiling, and leaning over for their kisses, too. An animal kisses story that leads to a sweet family kiss.